We are so excited about our second-grade program here at St. Francis School. The children are involved in the learning process through active participation in class activities. Sacramental preparation is an essential component of the second-grade curriculum. By modeling and teaching our Catholic values, the children continue their journey of faith formation. Parents and teachers work together to provide a strong foundation for the growth of the children. A nurturing environment allows each child to enhance his/her spiritual, physical, emotional, and academic growth. We inspire and motivate the children to believe in themselves and strive to do their best with each school experience. Our goal is to ensure each child’s success in our classes. Our mission is to instill in the children a passion for learning. By creating a loving and inviting atmosphere, the children learn to express themselves in all they do. We look forward to making the year memorable for all students. 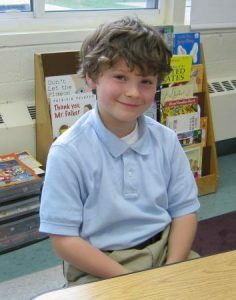 St. Francis offers a strong and varied academic curriculum for second grade students. Our focus is on the preparation for the Sacraments of Reconciliation and Eucharist. Our goal is to bring the children into a deeper relationship with Jesus and the Catholic community. It is essential that the children take an active role in their faith development. Our central theme is “belonging.” The children realize that they belong to many groups, most importantly the Church. They find that they strive to become actively involved in the Church community and help it to grow. Daily activities involving prayer, Scripture and doctrine allow the children to explore their faith and ask questions to deepen that faith. We expand on the daily lessons by having the children take part in weekly Masses, prayer services and school-wide service projects. We show Jesus that we love and respect the awesome gift of His true presence in the Eucharist as we participate in Eucharistic Adoration once a week. Each of these activities encourages the children to live their faith and become stronger in making choices to follow Jesus. Reconciliation preparation gives the children direction and reinforcement of their development of Christian values. Because their faith formation starts at home, the children have a fairly well developed sense of right and wrong. Throughout their preparation, the children are made aware of their personal choices and how they affect their relationship with God and the community. Daily lessons are enhanced through Scripture stories, group activities, reflective writing and discussion. The children are encouraged to make good and loving choices each and every day. Our faith continues its growth as we move into our next text about the Eucharist. This presentation invites students to be part of the Church community at the Table of the Lord. Each chapter introduces a part of the Mass designed to familiarize children with the celebration. Scripture, prayer and our offerings are the focal point in the Liturgy of the Word. As we move into the Liturgy of the Eucharist, the children are asked to look back at the great sacrifice that Jesus made for us. We recall the story of Jesus at the Last Supper and we “remember” His words as well as His actions, which help us center our faith on service to others. The children then participate fully in the Mass through the Sacrament of Eucharist. Each year the St. Francis of Assisi School staff determines a specific set of values that will be highlighted throughout the year. Service projects and school-wide activities are often linked to the values. Second grade classrooms will use the F.A.S.T. Reading Program. This is a research based literacy intervention program that features a flexible and quick paced approach. It combines the best of systematic phonics and literacy-based instruction to create a streamlined, hands-on program that transfers immediately to the reading process. The F.A.S.T. lessons deliver the phonetic component of reading using a multi-sensory approach: a magnet board and letters to build phonemic awareness and orthographic processing skills. Students then learn to spell and read syllables and complete words using the magnet board. Working on a magnet board makes it possible for many words and concepts to be taught and reviewed quickly. New concepts are introduced using the magnet tiles with minimal verbal instruction by the teacher. In the F.A.S.T. program, students learn letter and sound identification, blending, segmenting and manipulation of sounds. F.A.S.T. students understand the English language and its structure and gain access to the code and quickly transfer this to their reading. At least 15 minutes of reading at home each evening is essential in building strong readers. 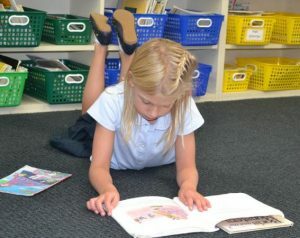 In second grade, the students also take part in the Accelerated Reader program. As we like to say in second grade: Read! Read! And Read some more!!! In second grade, the students will not have a phonics book. The phonics lessons will go hand in hand with the F.A.S.T. reading program. Some of the phonics skills that will be learned throughout the year are beginning and ending consonant sounds, short and long vowels and vowel patterns, consonant blends, digraphs and word endings. At the second-grade level, the Write Source pupil textbook is divided into the six traits of effective writing covered throughout the year. The text provides students with frequent writing opportunities to become strong writers. The Write Source series provides daily, scaffolded writing activities in every lesson. These activities help students learn to apply writing strategies, write to learn and prepare for written assessments. A resource skills booklet for building mechanics, usage, grammar skills and proof-reading practice provides second graders with guidelines, examples and models to assist with skill development. This workbook also provides follow-up work that helps the student apply what has been taught into his or her own writing. To assist in the writing process, lessons and activities are prepared that help the students identify different parts of speech. We concentrate on nouns, verbs, articles and adjectives and encourage the children to use specific nouns, strong verbs and creative adjectives to enhance their written work. Writing with correct sentence structure, including capitalization and punctuation, is essential. Editing marks are taught to help the children self-evaluate and correct their work. The Write Source text and skills books are used to enhance the language arts program. Children in second grade demonstrate proper formation, spacing, and letter size for manuscript writing. It is important that they use good posture and a correct 3-finger grip when writing. As the writing reaches a level of mastery, the students are introduced to cursive writing, at which point they add a slant to their paper and lettering to help with formation. The children are introduced to lowercase letter formation and letter connections. The math curriculum follows the Macmillan McGraw-Hill text. Time, money, place value, regrouping, measurement, graphing, and geometry are some of the areas addressed throughout the year. We continue with our knowledge of the basic math facts and devote much time, through the use of manipulatives, to understanding regrouping within place value. These facts and concepts are then put into story problems to build logical thinking and problem-solving skills. Our math program involves many hands-on manipulatives to allow for exploration and understanding of new concepts. Many small and large group activities, games and center activities are used within the course of the week to provide reinforcement of the learned skills. The second-grade curriculum for science, McGraw Hill’s Science: A Closer Look, combines areas of life science, physical science, earth science and the human body. Within each subject, children are involved in hands-on activities. Through the use of many different manipulatives, the children become active participants in class experiments. Students are introduced to the scientific method. Questions are asked, hypotheses are made, data are collected and conclusions are drawn. The children then use this new information to help structure their first Science Fair project. The second-grade social studies curriculum combines the use resource books, visual aids, trade books and map skills enrichment to implement standards and benchmarks in today’s classroom setting. Each unit throughout the year encompasses a wide variety of learning styles. Through the use of hands-on activities, large and small group interactions, report and journal book writing, as well as whole group instruction, students become more knowledgeable about the components of each unit. Field trips are interconnected within the curriculum to enhance the learning process. The focus of the elementary music curriculum is on making music. The musical concepts of melody, rhythm, harmony, form, style/expression and timbre/texture are taught in a cumulative fashion through the experiences of listening, singing, playing instruments, moving, creating and reading/writing. Physical education in kindergarten through grade three is dedicated to the development of fundamental motor skills, manipulative skills and movement experiences. The teaching at each level will focus on basic skills and the value of being physically fit, as well as the ability to display appropriate behaviors during social situations. The focus of the primary grades’ art curriculum is to build interest and confidence in creating art. The art concepts of cutting, shape recognition, drawing, color wheel, painting, paper construction and clay construction are taught in a cumulative fashion through both two-dimensional and three-dimensional projects. There is an introduction to the artwork of different cultures and various artists. Each student works independently to help improve his or her fine motor skills and hand-to-eye coordination. They learn to identify the proper parts of the computer and begin to explore the keyboard. Students use Hyperstudio and Kidspiration to sort and/or tell stories reinforcing social studies, language arts, and religion. By the end of the year, students are able to open and save documents to a class folder. Spanish class students will become acquainted with the Spanish language through fun and entertaining activities with puppets, music, picture cards, stories, skits, projects and vocabulary games. Learning about countries and cultures of Latin America and Spain will also be part of the Spanish program. Grades 1-2 will build vocabulary and continue achieving a higher level of comprehension and conversation. Beginning reading and writing has more emphasis at this time. We start by reviewing reading syllables and then moving into short sentences. Hispanic Catholic faith and culture is presented with short prayers, songs and traditions.